Everyone who has done a bit of traveling has probably noticed that there are huge price differences between plane tickets. 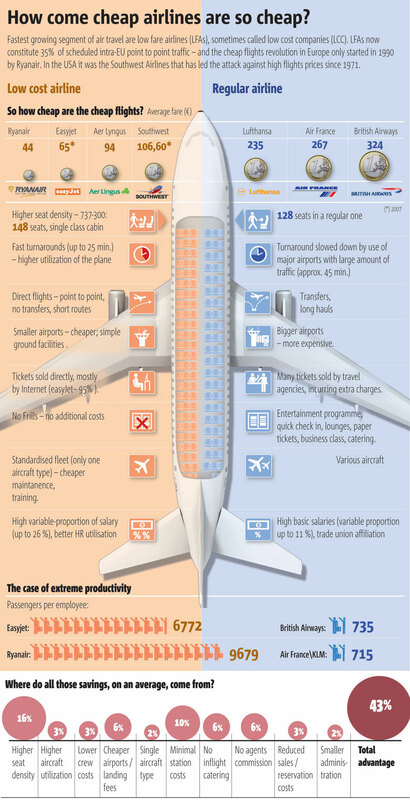 The reason is that there are traditional airlines and then there are cheap airlines. I live in Europe and here the 2 biggest cheap airlines are Ryanair and Easyjet – they are so utterly cheap that you can often get a plane ticket from one place to another for about 1 dollar. For example there have been tickets from Tallinn, Estonia (that’s where I live) to London for 0.01 Euros (yes, that is 1 cent). How is it possible that these cheap airlines can provide such cheap tickets and at the same time bring in increasingly larger profits? Check out the image below to find out how many more seats the cheap airliners cramp into their planes among other cost saving ideas they implement. Among the cost cutting ideas above there are a few things that are going to revolutionize air travel in the near future. Ryanair has just came up with 2 new ideas to cut costs even more. Offer standing places in the plane – this would allow to hold a lot more people in a plane! Lately Ryanair has also made the news for its policy to ask fat people to buy 2 tickets. Normal people seem to like the idea while fat people are feeling harassed! Wow, is this really true? I’m wondering: if traveling from Estonia to London is so cheap, then wouldn’t it be cheaper or of equal price to travel from London to France because geographically it’s closer from Estonia? I mean, in the end there is really no difference because there’s nothing cheaper than one cent. Also, Is it the same price travelling from London to Estonia as opposed from Estonia to London? Yes it’s true, but the 1 cent price is just a special campaign offer only available 2-3 times a year. Unfortunately usually the flight back is more expensive – anywhere between 30-100 euros. I am quite sure that there are similar campaign offers for London-Paris-London flights. I just checked Ryanair website and you can get a ticket from london to france for 9 GbP or about 14 dollars.